The heart of the Côte de Nuits, the central jewel in the necklace of Burgundy climats, the epicenter of the Grands Crus, Vosne-Romanée is probably the most celebrated of all the villages of the Côte d’Or in Burgundy. There are 152 hectares of vines of which 57 hectares are Premier Crus. Not only are its six Grands Crus the most famous names in Burgundy, but the producers who are based in the village are amongst the world’s finest. “Bourgogne has produced nothing better than this little corner where all her charms come together” wrote Gaston Roupnel, a celebrated historian and writer. Here the Pinot Noir grape ripens to its best. Apart from the 14 Premier Crus, the parcels found in the village appellation lie either at the top of the slope or at its foot on either side of the Grand Crus and in some cases reach the same altitude. The soils are limestone mixed with clayey marls. The depth of soil depends upon where the parcels are located from some tens of centimeters at the top of the hill to one meter deep around the village. The exposure is easterly. The typical characteristic of Vosne is ripe fruit over spices lifted by the presence of strawberry, raspberry, bilberry, or blackcurrant fruit. These refined and well-blended aromas evolve with age into aromas of preserved fruits, leather, cedar and gamey/woodland scents. On the palate the wine is velvety and distinguished. 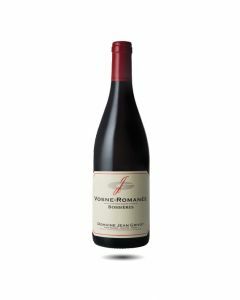 In their youth, Vosne wines can appear rather austere and closed; they need time in the bottle to develop structure and fleshy texture. These spicy, rich wines match well with roasted meats, especially beef and game and hard cheeses. This magnificent estate, which is ideally situated in the centre of Vosne Romanée, holds some very old vines producing very concentrated, pure wines. Despite the being of village level, the cuvee merits an exclusive bottling and label which mentions this special lieu-dit of which Etienne Grivot is so fond. A lovely combination of power and energy here. A wine with very expressive fruity flavours, mixed with aromas of violet and roses. Very lively and attractive. This village climat, lying just near the Grivot cellars produces wines that are more ambitious than the village appellation would lead you to believe. 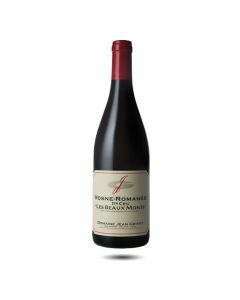 The 2014 is particularly fine with good fresh red fruit character in the nose, lots of energy and a fine vein of acidity running through the wine to a deeper, quite intense finish. A lovely wine with lots of charm to be enjoyed during the next five years. Very expressive nose with tight and concentrated notes of vanilla and red fruits. On the palate the wine begins to open to reveal berried fruit, excellent tannins and well-integrated oak. A powerful wine, which tastes much grander than its village appellation. Dit klimaat, gelegen nabij de wijnkelders van Grivot, produceert wijnen die ambitieuzer zijn dan zijn appellatie zou suggereren. De 2015 is, net als zijn broers, prachtig zijdeachtig en fris met tonen van kleine rode en zwarte bessen. In de mond is de wijn rond en genereus, wat het zonnige wijnjaar weerspiegelt. Zoet en heerlijk, deze charmante wijn is klaar om te drinken van 2020 tot 2025. One of our favourite wines from the Grivot domain, this 1er cru is located in the northern part of the appellation near Echezeaux. There is lots of fruit on the nose with flavours of plums, blackberries and blueberries. On the palate the wine becomes altogether more serious with some good oak, fine integrated tannin and a touch of mineral spiciness. This is a wine to lay down in the cellar for at least another 5-6 years. A fresh and expressive wine with lively notes of cherries and red fruit and in the background more serious, darker notes of tannin and good oak. Elegant and balanced, this wine impressed me when I tasted it out of barrels and I believe it has a good future ahead of it. One of our favourite climats, with a rich and complex nose which leads to tasty, spicy, woody notes. On the palate, the wine is quite tightly structured for now with lots of fresh red fruit flavour and marked tannins. A great wine which will age very well.